Our trip to Xiahe was timed to coincide with the once-a-year sight of one of Labrang Monastery’s huge thangka tapestries. While in the area we explored temples and towns, mingled with pilgrims as we watched ceremonies and performances, and hiked in the grasslands near Xiahe. Click through to see 35 photos from the trip. Click through to see the photos of the performances, streets and lanes, temples and walled towns, and more! 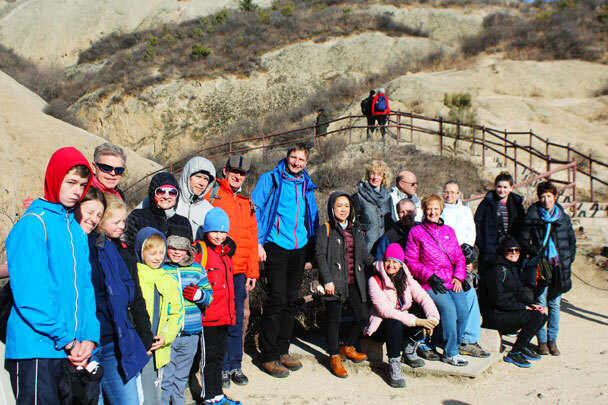 See 25 photos from a fun hike that took us up the ‘High Rise’ and then on to the Longquanyu Great Wall. See a set of 26 awesome photos from our last ice hike of 2018. We’ve been doing an annual ‘Long March’ for this company for more than ten years now. Click through to see shots from the 2018 event: a Huairou hike with 5km, 12km, and 16.5km options that crossed the Great Wall, hills, and valleys near the Little West Lake. See forty of our favourite photos from a weekday walk down the White River.